Alexander Herman is the assistant director at the Institute of Art and Law. This piece first appeared in The Art Newspaper. Be careful what you wish for. That may be the lesson for French President Emmanuel Macron as he received last week the report commissioned in March on the restitution of African artifacts currently held in French Museums. The commission followed the President’s speech in Ouagadougou, Burkina Faso, almost exactly one year ago, in which he had called for the conditions to be met within five years for the temporary or permanent restitution of African heritage to Africa. The report, which stretches to over 200 pages, was drafted by two academics: Felwine Sarr, a Senegalese economist and writer, and Bénédicte Savoy, a French expat working in Berlin. The report, which had been leaked ahead of time to some news outlets, was officially released on Friday evening – a strangely inopportune time to drop a report. Perhaps it was part of the plan. The Sarr-Savoy report comes as a wrecking ball to the quaint and tranquil world of ethnographic and anthropological museology. The report’s authors do not mince their words: “Behind a beautiful façade, questions of restitution invite us to get to the heart of a system of appropriation and alienation – the colonial system – of which many European museums have, against their wishes, become the public repositories" (my translation). And according to what the authors write in the report, as well as their subsequent comments in the media, the opportunity had presented itself to at last alter a discourse that had persisted, according to them, for far too long. But none of this came out of the blue. The impetus for it was the forceful – if somewhat open-ended – declaration of the French President last November, as well as the terms of the mandate set out in the mission letter from March. According to Mr. Macron, it is African heritage itself that needs to be restituted, either temporarily or permanently. This heritage (his word, patrimoine) cannot be interpreted as consisting of one or two items picked up by a missionary a hundred years ago. Something far more significant was clearly envisaged by the man at the top. The authors have heeded his call. They write clearly from a postcolonial perspective. The French empire, and colonialism more generally, are to them repugnant and restitution is seen as a partial salvation for the injustices of the past. Much ink is spilled covering instances of military expeditions and looting in the 19th century, such as the pillage of Abomey in 1892 and of Benin City by the British in 1897. For the authors, artifacts collected from instances such as these should be restituted to African states “swiftly” and “without additional research as to provenance.” This recommendation is made despite the recognition by the authors that the international rules preventing pillage were only codified in 1899, in what became the first Hague Convention on the laws and customs of war (see Article 56 in particular). Therefore, it is felt that, even if the legal status of these objects in French collections is beyond reproach, restitution should nevertheless be the outcome. As for items picked up during the so-called scientific missions of the early 20th century (referred to by the authors as scientific “raids”) or anything coming into a museum’s collection from a military or colonial officer, either directly or via family members, the presumption will be for restitution. A visitor looks at wooden statues from the Dahomey kingdom at Quai Branly museum in Paris on Nov. 23, 2018. However, if a museum is able to demonstrate that an item was acquired in Africa pursuant to a “free, equitable and evidenced” transaction, then the museum can retain it. The difficulty, of course, will be in proving that such a transaction occurred. The authors propose a reversal of the burden of proof. It will be up to museums to bring evidence of fair transactions, and not for the claimant state to prove lack of consent. For those who know provenance, this is a testy area, where proof is always difficult to come by. If the Sarr-Savoy report is to be followed, the whole landscape in France will shift. This has many museum people worried. The scope of the report was only to consider sub-Saharan Africa, a limitation that has already caused some degree of affront to other former colonies, such as Algeria and the rest of the Maghreb, not to mention Asian countries such as Cambodia and Laos. And it is also clearly focused on the French colonial domain. Despite the occasional reference to colonial looting by other European powers, such as the British at Benin City, this is very much a Franco-centric project. The coverage supposedly extends to 1960, the year generally understood to mark the end of French colonial interests in Africa with the advent of independence for Cameroon, Mali, Senegal, Chad and a number of other countries. For items that came into French museum collections after 1960 via gift or loan, the situation becomes a little more complicated, and the authors recognize that in those cases, “additional research” will inevitably be required to see whether they nevertheless fit into the categories described above. The authors take things a little further in considering museum items acquired after 1970, the year of the UNESCO Convention that aimed to curb the illicit trade in looted cultural property. For those goods, museums would be able to hold on to them if they can demonstrate that appropriate due diligence was undertaken prior to acquisition. However, it is not explained in any great detail what this due diligence would entail. Owing to the obviously disruptive nature of these suggestions, the report has been heavily criticized in the short time available since its release in art historian and museum circles alike. There is some validity to the criticism. 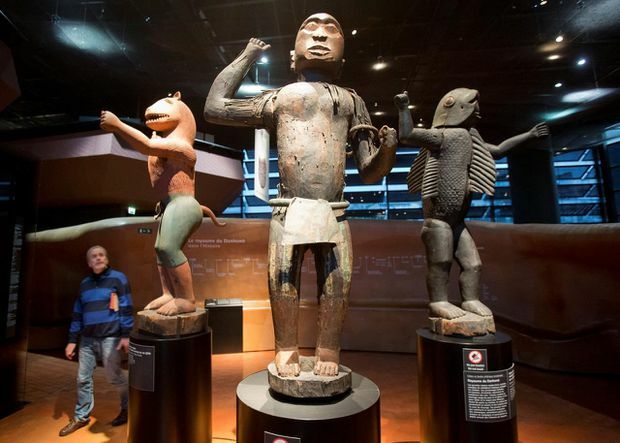 France is estimated to hold at least 90,000 African artifacts in its museums (as many as 70,000 alone in the Quai Branly-Jacques Chirac Museum in Paris) and having to restitute a great many of these – whether “swiftly” or through the reverse-burden of proof – would be a bureaucratic nightmare for museums who are already overstretched, underfunded and having to defend their very raison d’être in the modern world at every turn. The process, not to mention the transport and the insurance, would cost a small fortune. And the whole thing has the potential to open up wounds relating to French identity that were already on full display during the previous elections in France. Even more uncertain is the legal mechanism by which such restitutions would be accomplished. This is a major issue in France where all public collections are considered inalienable, meaning it is impossible to remove even the smallest fragment from a museum’s collection, whether to sell it or, more altruistically, to restitute it. By way of contrast, Canada does not adhere to this principle. In Canada, there are no legal bars for national institutions looking to restitute – or even sell – items from their collections. I had written about this situation in these pages in April during the scandal caused by the National Gallery of Canada’s attempt to sell off one of its paintings by Marc Chagall. As an example, the French Bibliothèque Nationale had been in possession of numerous Korean manuscripts that had been taken by French forces during a punitive expedition in Korea in 1866, a military engagement not unlike those used in Africa at the time. In 1991, the Koreans began asking for their return. It was only in 2010 that former president Nicolas Sarkozy decided to restitute them to South Korea, the morally correct (and diplomatically deft) thing to do. 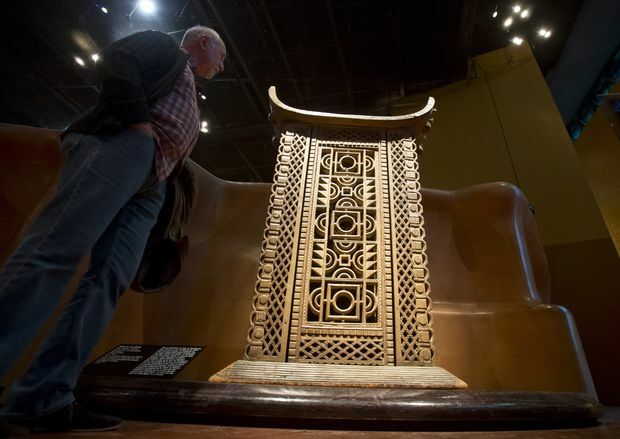 The wood and metal throne of King Ghezo on display at the Quai Branly museum. However, owing to the principle of inalienability, the attempt was frustrated. The librarians and curators from the Bibliothèque Nationale were incensed, protesting the president’s moves along the way. Finally, a creative solution was found, one that would see the manuscripts go out on a long-term loan, one that could be renewed every five years ad infinitum. So, to this day, they legally remain part of the French collection, but physically (and in all practicality), they are in South Korea, where they will remain, likely forever. The problems encountered with the Korean manuscripts will inevitably arise with the African artefacts: there are legal blocks to permanently removing items from French collections and, as a practical matter, there will almost certainly be push-back from the museums themselves. The matter of getting around the inalienability is dealt with in the report. The authors, who it should be mentioned have been supported in their task by an esteemed legal expert from the University of Paris Nanterre, Vincent Négri, have proposed the following: that the restitutions to an African country occur within the parameters of a bilateral agreement between France and the relevant country. By creating an obligation through France’s international relations, it is suggested that restitution of the artefacts would override any domestic principle of inalienability. This schema would, if the proposals are approved, form part of the Code du Patrimoine (the French heritage law), thereby giving the entire arrangement a legal basis. I’m unable to comment on the constitutionality of that proposal under French law, but it is certainly a clever idea. Whether it works, though, both legally and practically, is another matter entirely. As for President Macron, a release from his office accompanied the circulation of the report on Friday. Most remarkable in the statement is a promise to return, it seems immediately, 26 objects that had been taken by French forces from Abomey in 1892. Those items, which include a remarkable lion-headed man standing nearly two metres tall, would go to the small west African country of Benin, on whose territory the Dahomey Kingdom once existed. This is surprising: As a restitution, it contradicts the very proposals in the report. While it can certainly be considered swift (the word rapide is used in the report), it ignores the very legal structure that was to underpin the project of restitution: a bilateral agreement between France and the relevant African country, here Benin, that would establish the framework for restitution. It is difficult to see how Mr. Macron, like Mr. Sarkozy before him, will get around the rule of inalienability without a change to the law (none has so far been proposed to the French Parliament, the law-making body in France) or through the creative use of long-term loans. The other point that comes across in the President’s news release is an obvious interest in exploring other forms of restitution, meaning non-permanent restitution such as joint exhibitions, loans, exchanges and the like, as well as co-operation between France and African countries. The authors of the report had preferred not to consider “temporary” restitution, which had been included in the initial Burkina Faso speech of 2017, except insofar as they are transitional and lead toward permanent restitution. This is a rather contentious reading of the initial mandate, but it makes clear the position of the authors (if ever evidence were needed): They aren’t concerned with halfway measures. They have seen an opening – possibly a paradigm shift in this area – and they have pushed ahead with a proposal that envisages the wide-scale return of cultural artifacts to sub-Saharan Africa. The question remains whether Mr. Macron will do anything more about it. Perhaps the 26 objects to be returned to Benin are just the beginning. Or they are the culmination of a well-intended but short-lived affair, like an exploding star, visible for an instant, bright and dazzling, before being eclipsed by the night sky.